At Hush Panels NZ we strive to deliver the highest quality products and service and offer a standard range of panels along with custom design options. Our Hush Panels can be supplied on a selection of timber based substrates, with a range of finishes and all come complete with our 100gsm black fabric backing. Our standard range of panels have all be acoustically tested by Marshall Day Acoustics and we recommend the use of Autex AAB-35/50 acoustic matting for the optimum acoustic benefit. If you are unable to find the product or pattern you are after, please contact us for further information. When designing a room it is important to give consideration to how a room will sound in order to optimise speech intelligibility. Indoor ambient noise levels are one of the most critical elements in room design as the speaker’s voice needs to be clearly heard above other sounds. This is where Hush Panels can help, used as a wall or ceiling lining in conjunction with Autex AAB Acoustic Blanket or similar product, our Hush Panels will greatly reduce the reverberation in a room allowing for better sound clarity. 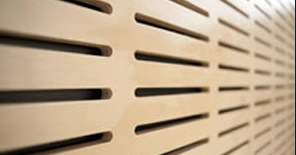 Hush Panels come in nine standard designs that provided an NRC rating of up to .75. These range in open area from 8.6 – 31%. Hush panels can also custom make your panels to suit your individual requirements. View our range of wall and ceiling linings here. Hush Panels offer five standard designs for these ceiling panels with a selection of three different edge details. Hush panels can also custom make your panels to suit your individual requirements. Hush Panels offer five standard designs for these ceiling panels with a selection of three different edge details. Hush panels can also custom make your panels to suit your individual requirements. View our range of wall and Suspended Ceilings here. 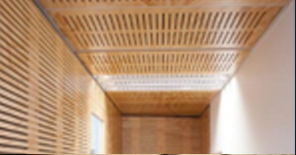 We are able to produce our Hush panels in any available wood based sheet material. 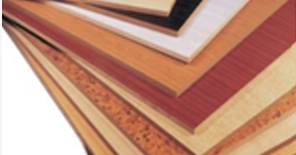 We have a range of products we commonly use including our Group 1S Torchguard® MDF or PLY. For further information and options please check out our substrates page. Radiate Plywood (Including Torchguard® Ply), MDF, or Timber Veneers on our group 1S Torchguard® MDF are just a few of the substrates we use. View our range of wall and Substrates here.